Five Ways to Detect a Cyber Threat - Symtrex Inc. 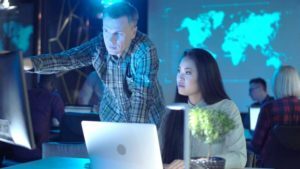 In order for businesses to counter the ever-growing amount of network security risks, having an effective security plan has become increasingly critical. The plan must implement strong IT security tools, and there must be a strategy for emerging threats. You and your team can become part of the detection process by making use of the following tips. Phishing refers to the practice of sending emails that try to induce individuals to reveal personal information, such as passwords and credit card information. Most recently, it is designed to spread Ransomware and other malicious threats. While some phishing emails are extremely easy to spot, others require more due diligence in reviewing the email prior to clicking the links or opening the attachments. You can find out what percentage of your employees is susceptible to phishing attempts with our free phishing security test. This is a cornerstone to identify a potential cyber threat. Unusual activity includes logging into the system after hours, multiple login attempts, or activity from IP addresses that are overseas. Utilizing a logging tool or network access control can assist in reviewing this activity. Your users should be able to identify when their systems are not working to the level that they are accustomed. Slow networks or machines can indicate trojans or malware that is working behind the scenes. Review your log files from your firewalls to review the network traffic. When developers release updated versions of their software, it often includes a security update. You and your team can help to reduce the likelihood of an attack by ensuring all software programs are up to date. Even with all of the security tools available today, there is a chance that you may already be compromised. Running a compromise assessment can proactively discover the presence of active or dormant threats that may have evaded your organization’s security defense.